This quote comes from when Joker has Commissioner Gordon held captive on a ride with photos of Barbara Gordon displayed from when she was shot and stripped naked, all just to try to break the Commish, and…Well, I’m gonna let Troy Baker field this one. …Because how could I not include this? The thing is, you gotta figure this quote plus the completely contradictory quote later on indicates one of two things: Either The Joker is completely insane and doesn’t remember how he got his scars, referencing back to The Killing Joke and how he remembered his origins slightly different from day-to-day, or he’s a liar and his explanations are mere parody at such simplistic reasons for what he does. 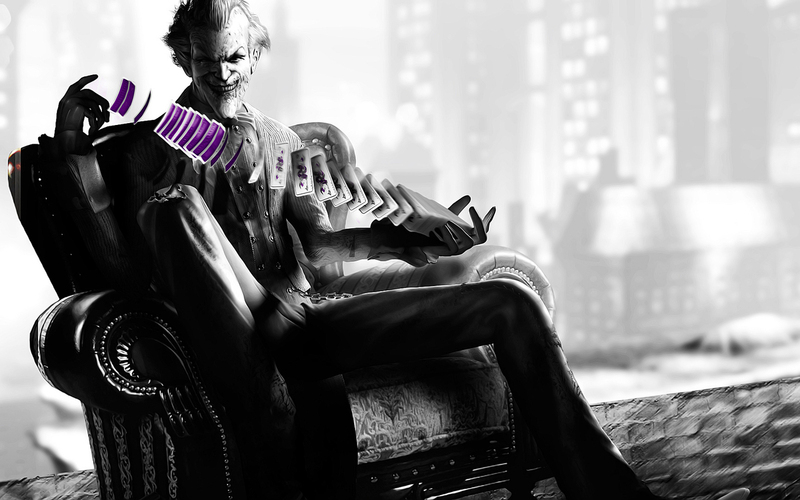 So, those are my 5 Favourite Joker Quotes. Got one that’s not on here? Feel free to post it below in the comments, and let’s see about doing this again soon for more comic book characters. Ja né! …Yeah, I kinda neglected to do this last week, and you’ll understand why when we get to it. Also, it ended up working out pretty well, since I bought something yesterday, and received a little something that I paid for a week ago and was expecting to receive at Harbour Con, but was ready for me a couple of days early. So, let’s start with what I bought last week, Talon #10. Adjectiveless X-Men #3 had a bit of a delightful mislead: Rather than the box with the ticking timer being a bomb, it instead is an override device that pretty much sets the X-Mansion against Kitty Pryde and the students, though they seem to be able to get out of danger just fine thanks to Bling (Hey, I’m finally learning people’s names! ^_^ ). Meanwhile, the rest of the team go with Sublime and track Arkea to a hospital. It seems she’s been busy with the patients, enslaving their minds, but Psylocke holds her at…erm, blade-point, while she’s in Karima’s body. 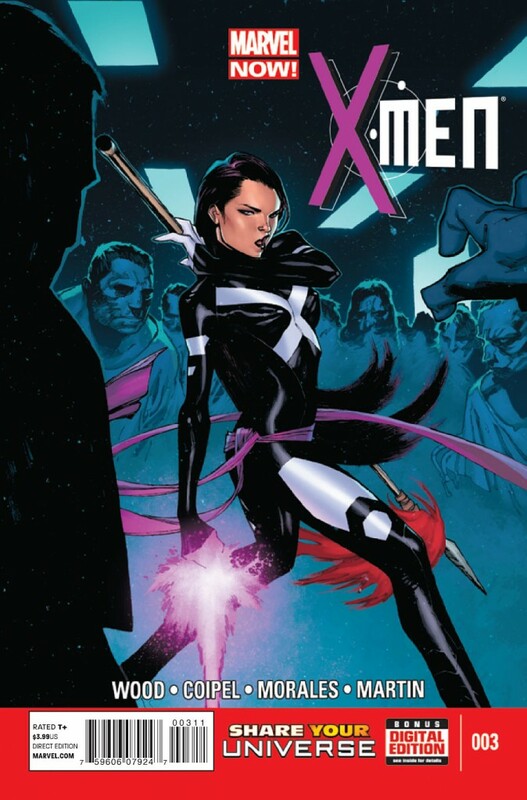 She seems hesitant to go through with taking her down, though, but Karima manages to regain control just long enough to take Psylocke’s blade and damage herself enough to seemingly force Arkea out, though she leaves herself in critical condition. Overall, another great issue of a series that is definitely my favourite Marvel book thus far, with some awesome moments with Jubilee and her kid, and I honestly kinda hope Karima recovers well enough that she joins the team. Just seems like the logical step to make given how much time they used to establish just how much she means to the X-Men. 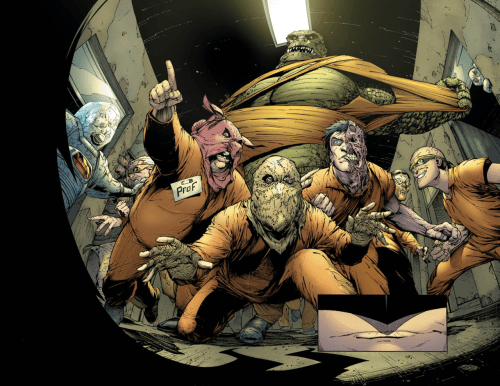 So when I learned that Batman Annual #2 was gonna be a tie-in to Zero Year, and then saw the preview pages showing him walking into Arkham Asylum in the costume to be locked away, I naturally was like “WTF?! They locked him up?!”. However, it seems Scott Snyder was kinda trolling us with those first few pages, as Batman’s actually there to test the new security systems. So how does this tie-in to Zero Year? Well apparently, while looking through files at the Asylum, he attracted some unwanted attention by a woman staying there who can walk through walls, referred to as the Anchoress. Essentially, she’s there because she actually WANTS treatment, but over the years, less attention was given to her as Batman started sending additional villains there. She breaks out when she finds out he’s present and nearly traps him in an inescapable prison of his own mind, but thanks to some help from a new guy working at the Asylum, he manages to stop her and return her to her cell, all the while the new guy arranges for the Anchoress’ treatment to be restored. Overall, a nice read, and much better than the last Batman Annual. 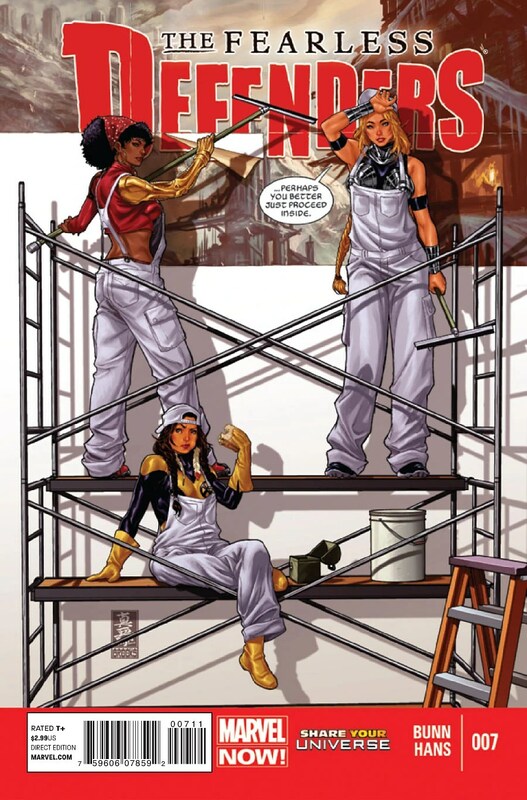 Fearless Defenders #7 promised major change to the status quo, and it has. As you’ll recall, last time on Fearless Defenders, fan favourite Annabelle Riggs died to stop Valkyrie’s rampage as the Maiden of Rage. Well, good news to fans of the character, she’s alive again!…Sorta. I’ll admit, I’m a little confused, but long story short, Valkyrie goes to Valhalla where she finds Clea and asks her to resurrect Annabelle. Clea says it can only be done with a sacrifice of some sort, though it appears to work just fine, and they all return to Misty Knight‘s safe house, Valkyrie stating that Clea would be safer with the Defenders. However, upon arriving, only Clea and Annabelle are present, until Annabelle turns into Valkyrie, Clea stating that the two will need time to get used to some changes. I read that and was like “…Wait, WHA?? ?” over and over for a good fifteen minutes. As near as I can tell, Annabelle’s spirit has been bonded to Valkyrie’s, and they essentially are now, as SongbirdDiamond on Twitter referred to them, the Superior Valkyrie…Except, y’know, not stupid. lol Either way, colour me intrigued. And now, the big one: Batman Incorporated #13, the end of Grant Morrison‘s run on Batman, and……..I feel kinda underwhelmed. Now, before ANYONE calls me out on this, I am NOT saying this is a bad comic by ANY stretch of the imagination. 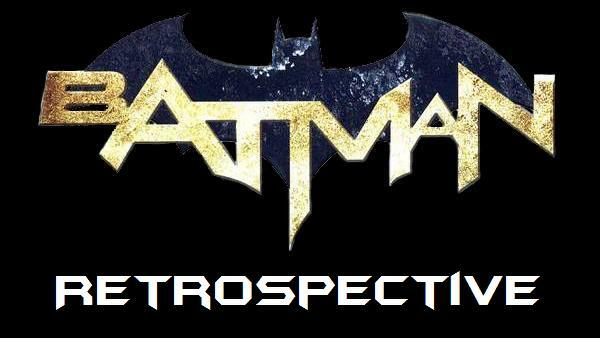 However, I did see a couple of things coming from a mile away, namely that the mystery woman who kidnapped Jason Todd was Kathy Kane, the original Batwoman, and that Talia was going to die, killed by a bullet to the skull by Kathy. 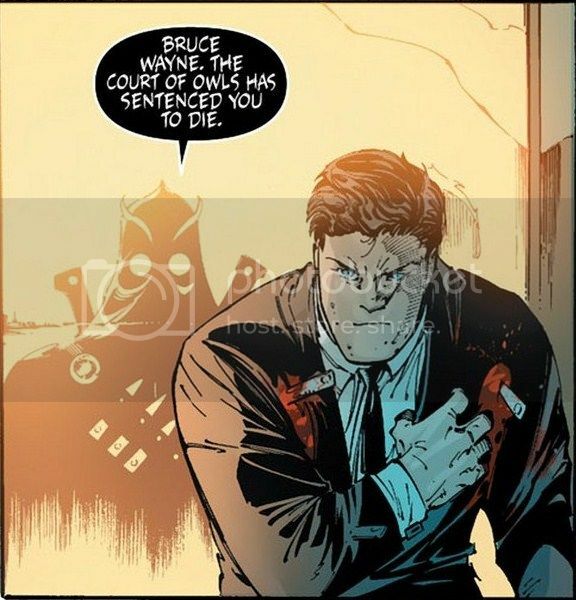 All of this is being shown to us as Bruce narrates the events to Commissioner Gordon at the GCPD, following his arrest that we saw in Batman Incorporated #1 of the New 52. He tries to be a bit vague, though, as to keep Jim from knowing that he and Batman are one and the same. However, some inner monologue boxes from Gordon suggests that he’s always had a hunch that they are but keeps it to himself, mainly because it doesn’t really matter to him who Batman really is. Then we learn that some woman (most likely Kathy) has bailed Bruce out and gotten the charges against him dropped. All the while Bruce was contemplating shutting Batman Inc. down, but a returning Alfred gives him reason to stick around: Damian and Talia’s graves, both dug up and their bodies missing. And as this goes on, Ra’s al Ghul has retaken control of the admittedly battered League of Assassins and is now breeding an army of Damian clones. So why do I feel underwhelmed by this issue? Well, because this is the LAST issue of Grant Morrison’s run, and despite it ending where it began, with Bruce and Talia and Damian, I’m left with so many frakking questions! How did Kathy Kane bail Bruce Wayne out of all his charges and lift the ban on the Bat Symbol? What’s Jason Todd’s plans now that it’s been revealed he was actually working for Talia but betrayed her? 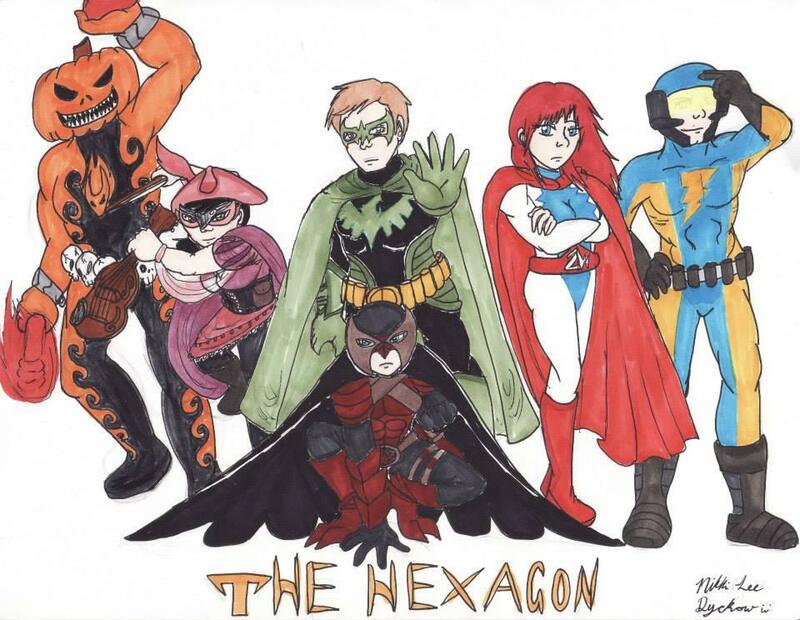 What happened to Talia and Damian’s bodies at the end? If the Fatherless was the actual individual to become Batman 666, why are we getting a ‘What If?’ mini-series about how Damian becomes Batman 666? With so many Damian clones being created, does that make it possible for the real one to come back someday? Is the British Government really going to resurrect Knight somehow? 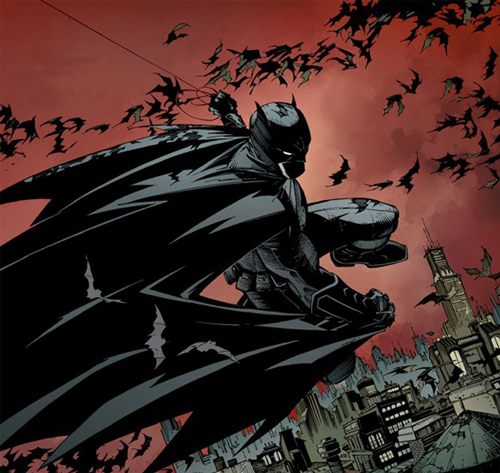 What’s the status of Batman Incorporated as a group now that the book is cancelled? Is there any chance they’ll let Chris Burnham do a Batman of Japan series? And most important of all, WHO’S GONNA FEED BATCOW?!?! …No More Pretending…No More…! NO MORE! Now, of course, I expect that all these things will be answered soon enough. However, if Grant Morrison was going to create so many major changes to the status quo, you’d think he’d wanna give the resolution himself, unless of course it turns out he wanted to but for whatever reason he couldn’t. Either way, it leaves a lot unresolved for his LONG run with Batman. Still, as I said before, it ended where it began, and that’s oftentimes the best place for a massive story-line to end. So that’s it for this week. Next week, we check in with The Movement and their attack on a police headquarters, and venture back to the world known as Earth 2. Ja né! 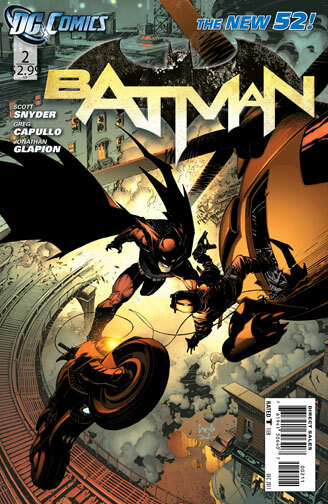 We got three comics that are leading into the conclusion of Death of the Family, so let’s start off with Batman #16. Lemme just give a hint to people that plan to wait until the trade comes out to buy Death of the Family: Whenever you think you know what the Joker is planning, slap yourself in the face and say “No, you don’t”. 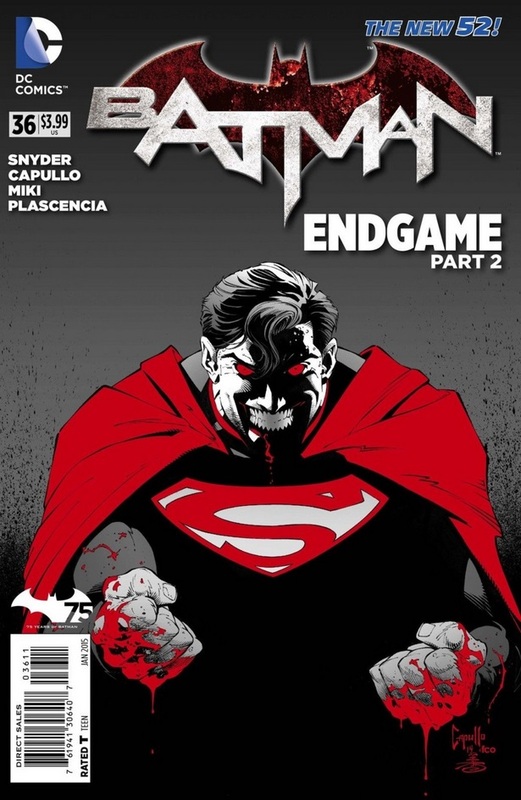 I almost feel like Scott Snyder is trolling me in that sense sometimes. Now, at this point, the Joker’s master plan appears to be slowly but surely unveiling itself for what it truly is, but I wouldn’t be surprised if I’m actually way off on what the end result of this story is. 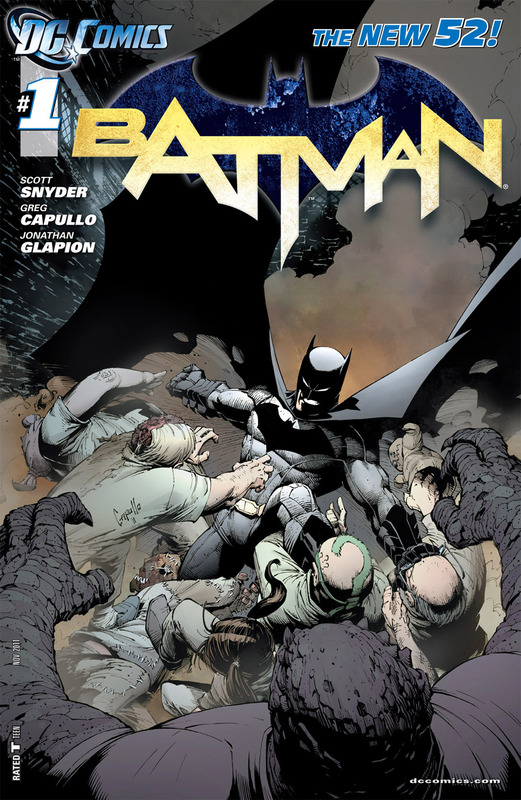 If I have one complaint about this book, though, it’s that there’s a short montage of sorts where Batman fights through several of his rogues gallery to get to the Joker in Arkham Asylum, but he makes each fight quick and relatively easy looking. And these aren’t second stringers either. Frigging Mr. Freeze is in there. It just seems too easy for him, the way he breezes past them. Also, horse lovers might not exactly like this book all that much, since there are two horse fatalities in it. Still, this comic continues to keep me on the edge of my seat, and I’m somewhat mortified by something that happens at the very end, and we’ll get to that later. Batman & Robin #16 was…well, here’s the thing. I felt none of the emotional tension they were trying to convey in this story whatsoever as Robin was fighting ‘Batman’ because I frigging KNEW that wasn’t really Batman. I’m sorry, but I could just smell the fake-out coming from the instant I was done reading last month’s issue. 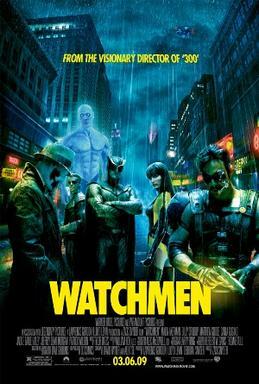 That was the inherent problem with this particular tie-in: I knew the real Batman couldn’t really be there. 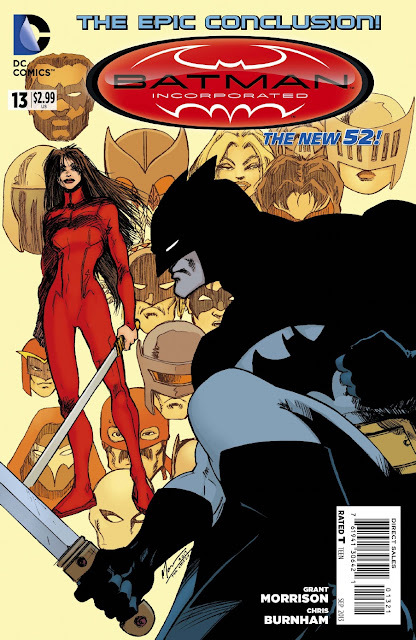 It’s also part of the problem with this being a Batman & Robin book instead of a Robin book: Batman HAD to be there. Seriously, this book needs to drop Batman as a main protagonist and just be a Robin comic. Heck, it technically already is, just not in name. 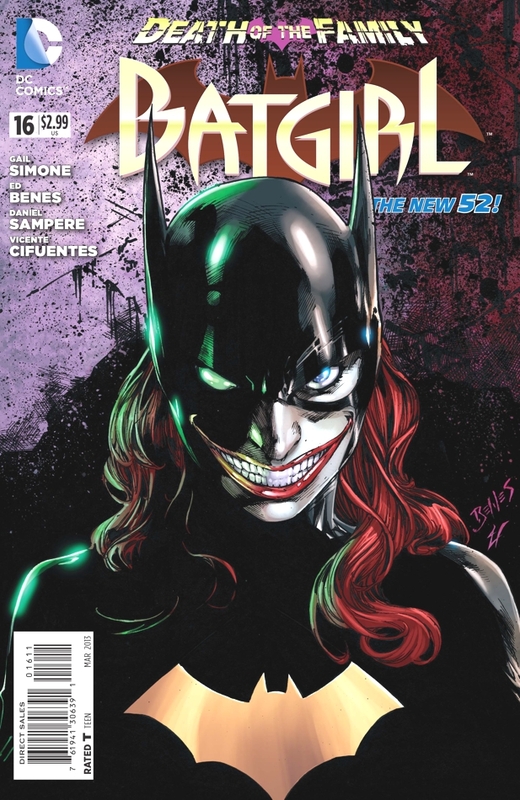 Batgirl #16 is wonderful and creepy, as the whole series has been. I’m gonna miss Gail Simone…for the two months she’s off. lol Long story short for this issue, Joker tries to wed Batgirl, James Gordon Jr. gets involved, massive fight breaks out, ends with a destroyed church…Well THAT’S not gonna go over well. To those who were actually wondering if they were going to pull this, no. Batgirl does NOT get married to Joker. Duh. However, we get a scare at the very end that’s quite similar to what we see at the end of Batman and Batman & Robin, which means it’s finally time to talk about this. …So yeah, that was all for this week. Check in next week when the Joker continues to give us nightmare fuel in Nightwing #16. And I think come this time next month, I’m gonna want a few barf bags ready. Ja né.